A suicide bomber killed 15 people at a rally for Pakistan's suspended chief justice Tuesday, officials said, ratcheting up tension in a country already reeling from a burst of violence by Islamist extremists. Pakistani security officials tell CBS News that the head of the suspected bomber had been found at the scene. CBS News' Farhan Bokhari reports local television was showing images of body parts strewn about the area where the rally was taking place. The attack came before a verdict in a legal battle that has pitched judge Iftikhar Mohammed Chaudhry against President Gen. Pervez Musharraf and which could determine the U.S.-backed military ruler's political future. Musharraf condemned the blast, which followed a string of suicide attacks on security forces and the storming of Islamabad's radical Red Mosque, as a "terrorist act." However, Chaudhry's supporters accused authorities of being behind the latest mayhem in the capital. Chaudhry was still in a car heading toward the district court in Islamabad to address lawyers who have led mass protests against his suspension when the attacker struck at about 8:30 p.m.
Kamal Shah, a top Interior Ministry official, said 15 people were killed and 44 others wounded. Opposition party activists, police officers and bystanders were believed to be among the victims. Three security officials, speaking on condition of anonymity because they were not authorized to speak on the record, said it was a suicide attack and that the severed head of the victim had been found. The attacker blew himself up on a tree-lined street leading to the large tent erected next to the court just as hundreds of people converged on the area, which was also busy with evening shoppers. Police ran yellow tape around the scene of the blast, where pools of blood, pieces of flesh and scattered shoes lay on the asphalt next to a blood-spattered car. "I was not far away from the stage set up for the chief justice when I heard a big bang," said Tahir Abbas, a lawyer who had come to attend the rally. The attacker struck next to stalls set up by Pakistan's two main opposition parties of exiled former prime ministers Benazir Bhutto and Nawaz Sharif. Chaudhry was still several kilometers (miles) away at the time and arrived shortly afterward at the scene, where police ushered his vehicle toward another entrance to the tent. He spoke briefly with lawyers, who said he had offered prayers for the victims, but canceled his speech and left. "This was an attack on the chief justice," said Munir Malik, one of Chaudhry's lawyers. Asked who could be behind it, Malik accused Pakistan's intelligence agencies, and said the government wanted "to get rid of the chief justice." However, Raja Pervez Ashraf, a leader of Bhutto's Pakistan People's Party, said the attacker had targeted her activists. "Most among the dead and injured are our supporters," Ashraf said. 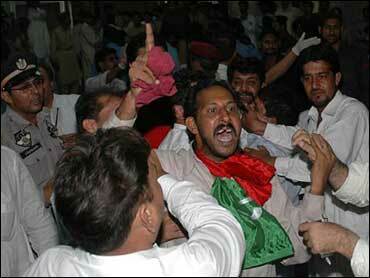 Television footage showed supporters of Bhutto wailing with grief and chanting slogans against the government. Musharraf "condemned in the strongest terms the latest terrorist act which took place in Islamabad," the state-run Associated Press of Pakistan reported. He ordered an immediate inquiry and appealed to the public "to remain calm, vigilant and assist the authorities in unearthing the culprits and bringing them to justice." Shah said it was too early to "raise a finger at someone" in connection with the attack. Some analysts and diplomats expect Bhutto to team up with Musharraf in a power-sharing government after elections due later this year. She was the only opposition leader to voice strong support for the crackdown on the Red Mosque. Bombings and suicide attacks blamed on Islamist extremists had already killed more than 100 people since Musharraf's decision to attack militants holed up in the mosque and deploy troops in militant strongholds near the Afghan border. Leaders of the Taliban and al Qaeda have called for revenge attacks, and the latest suicide blast killed three soldiers in the volatile North Waziristan region earlier Tuesday. However, there had been no indication that they would target Chaudhry, whose refusal to resign in the face of charges of misconduct has catalyzed opposition to Musharraf's seven-year rule. Musharraf suspended the chief justice on March 9, accusing him of nepotism and securing unwarranted perks, such as the use of luxury cars and government airplanes. While the general insists he had no political motive, opponents accuse him of trying to remove an independent-minded judge who might uphold legal challenges to Musharraf's plans to extend his rule. The Supreme Court, which has been hearing an appeal by Chaudhry in which the government's case has appeared shaky, was expected to announce a verdict as early as Friday. Opponents accuse Musharraf of manipulating Pakistan's shaky security situation in order to persuade the United States, his key backer, that he remains a vital bulwark against terrorism. There is also speculation that Musharraf could declare a state of emergency, which could delay year-end elections where the ruling coalition risks losing its majority. The government was trying Tuesday to salvage a disputed peace deal in North Waziristan, a hotbed of Taliban and al Qaeda militancy on the Afghan frontier. Musharraf argues that the deal, which saw the army scale back military operations in return for pledges from tribal elders to expel foreign fighters and prevent cross-border attacks on U.S. troops in Afghanistan. Washington has pledged $750 million over five years to help develop the impoverished region and dry up support for Islamic extremism rooted in the U.S.-sponsored war in Afghanistan in the 1980s. However, U.S. officials are pressing for more military strikes to crush extremists they believe may be planning Sept. 11-style attacks in the West as well as fomenting trouble in the region. "Now, having dealt with the mosque, it's pretty much crossing a line and there's no going back," Assistant Secretary of State Richard Boucher said Tuesday. While a civilian "hearts and minds campaign" may offer the best long-term solution to combating extremists in the region, "some elements have to be dealt with militarily," Boucher said. Meanwhile, a new intelligence report out Tuesday makes for disturbing reading. The U.S. National Intelligence Estimate, the consensus view of all 16 U.S. spy agencies released Tuesday, said the U.S. would face a "persistent and evolving" terrorist threat in the next three years. The report paints a worrisome picture of increased training at camps along the Pakistan-Afghanistan border, giving al Qaeda added capability to mount strikes on the U.S. and its key allies. CBS News correspondent Elizabeth Palmer reports that while the northern area of Pakistan, much of which is controlled by local tribes, has always been a stronghold of the Taliban, it's now also home to a resurgent al Qaeda. New training camps have sprung up in the mountainous terrain, and the ease with which militants operate in the region even affords them time to produce the relatively high-quality training and propaganda videos frequently released by jihadist groups. Pakistani soldiers on duty in the region are all but helpless, reports Palmer. Even the generals are fed up with the situation. "Even after five years of operations, what has been achieved? Osama bin Laden is still there, al Qaeda is still there, in fact it is spreading," Lt. General Ali Jan Mohammed Aurakzai (Ret.) said in February. Aurakzai is the governor of the Northwest Frontier Province. White House Press Secretary Tony Snow says the report shows this is no time for America to let down its guard. Snow says it is "always all hands on deck" when dealing with terrorism. Musharraf is one of President Bush's most vital allies in the so-called war on terror, but he's under intense, and rapidly increasing pressure at home in the wake of the bloody government siege at the Red Mosque in Islamabad.